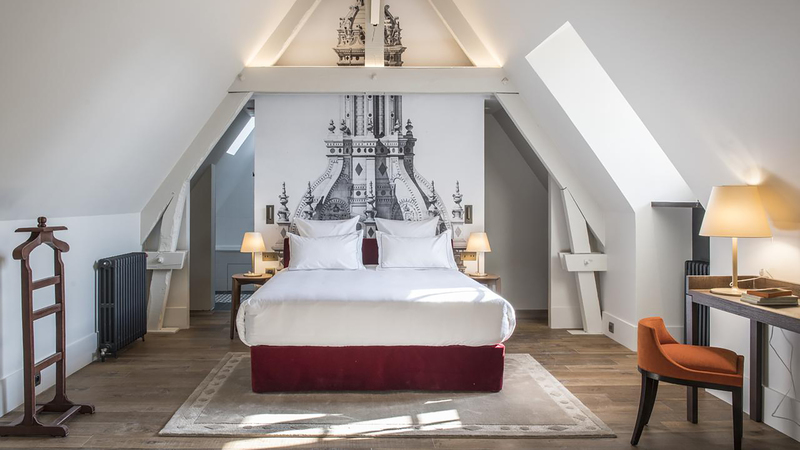 The new, fully renovated Relais de Chambord, a member of the Small Luxury Hotels of the World chain, combines the charm of a large country house with the high-end comfort of a contemporary 4-star hotel. But what makes this elegant riverside hotel, 20 min. from Blois, really special is its stellar location directly facing the majestic Château de Chambord, King Francis 1’s Renaissance masterwork. You won’t have to walk far to get there, 50 meters to be exact, which means you can go in the early morning or after the crowds leave for the evening, when you’ll have the château, set in the heart of the largest enclosed forest park in Europe, all to yourself. The hotel has 55 rooms and suites, each of them spanking new, stylishly decorated, and overlooking either the Cosson River or the château. So after a day of sightseeing, relax and enjoy the peace and quiet – and the view - in the comfort of your room. Then head down to dine at one the hotel’s 2 restaurants: the chic ‘Grand Saint Michel’, for fine French regional cuisine, or at the bar, for a snack-style menu. A continental buffet breakfast is available each morning – and what a spread, with its wide selection of fresh fruit, pastries, croissants plus eggs and bacon made to order any way you like. In fine weather, you can enjoy breakfast, a drink or dinner on the large outdoor terrace with the hotel’s pretty landscaped garden in the foreground, and the spectacular view of the turrets and spires of Chambord’s famous rooftop skyline as a backdrop. Treat yourself to a personalized beauty care treatment or a soothing massage at the hotel spa, with its relaxation area, tearoom, hammam, sauna, and an outdoor Jacuzzi overlooking the river. Explore the surrounding areas by bike…electric bicycles are available to travel to and along the banks of the Loire. Or book a VIP tour to see the sights on horseback or in a carriage. The Château de Cheverny is only 18 km away from the hotel, and Blois just a short hop. But you may want to stay put and make the most of the spellbinding views of Chambord you’ll be able to enjoy without even leaving the hotel!